The Monsters’ Almanac is a fully illustrated, beautifully designed and printed year-round guide to all the important dates and happenings in the horror film calendar. A detailed look at the eternal question: what makes a monster a classic monster? Check out what (and who) you share your birthday with! This one-stop horror movie history guide is a must for all fans of classic horror movies. 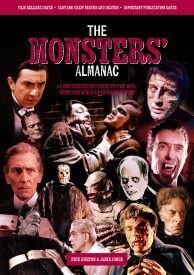 Whatever type of horror movie you’re into, you’ll find The Monsters’ Almanac has plenty for you. Image of Alan Gibson, Christopher Lee and Peter Cushing from Dracula AD 1972 (Hammer 1972) used courtesy of Marcus Brooks, The Peter Cushing Appreciation Society. The Monsters’ Almanac is freaking awesome!!! I absolutely love it!! The Monsters’ Almanac is awesome! 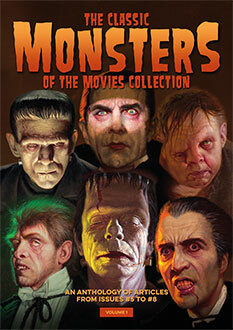 It renews the belief that the classic monster films beat out any horror/monster movie that was made past 1960! Super, super cool. Love The Monsters’ Almanac. Just got my Monsters’ Almanac. Thanks, you’re the real deal! The Monsters’ Almanac is very cool, thank you. My fave Universal film is top center on the cover – even nicer! I just opened my copy of The Monsters’ Almanac and it’s awesome. This is an awesome book and a great read for any horror fan. Thanks for this great book I’ll enjoy reading it. All the monsters in the palm of your hand – The Monsters’ Almanac! Great book! Very informative about all the classic movies and actors. Highly recommended!